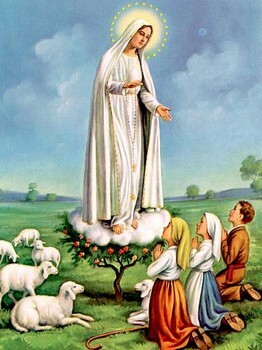 The Blessed Virgin Mary, the Mother of God, appeared six times to three shepherd children a("The Three Seers") near the town of Fatima, Portugal between May 13 and October 13, 1917. Appearing to the children, the Blessed Virgin told them that She had been sent by God with a message for every man, woman and child living in our century. Coming at a time when civilization was torn asunder by war and bloody violence, She promised that Heaven would grant peace to all the world if Her requests for prayer, repration and consecration were heard and obeyed. "If My requests are granted ... there will be peace" 3seers.jpg - 8.5 KOur Lady of Fatima explained to the children that war is a punishment for sin and warned that God would further castigate the world for its disobedience to His Will by means of war, hunger and the persecution of the Church, the Holy Father and the Catholic Faithful. God's Mother prophesied that Russia would be God's chosen "instrument of chastisement," spreading the "errors" of atheism and materialism across the earth, fomenting wars, annihilating nations and persecuting the Faithful everywhere.